Age doesn't matter, it's what's in your heart | Center for Family Services, Inc.
One of the things that has never ceased to amaze me since my first day at CFS, nearly 10 years ago, is the selflessness of this community. The number of young people who have given up Birthday presents and volunteered with huge smiles on their faces over the years is a source of renewal for me. Here is yet another story of a young person who “just wanted to help”. No demands for recognition. 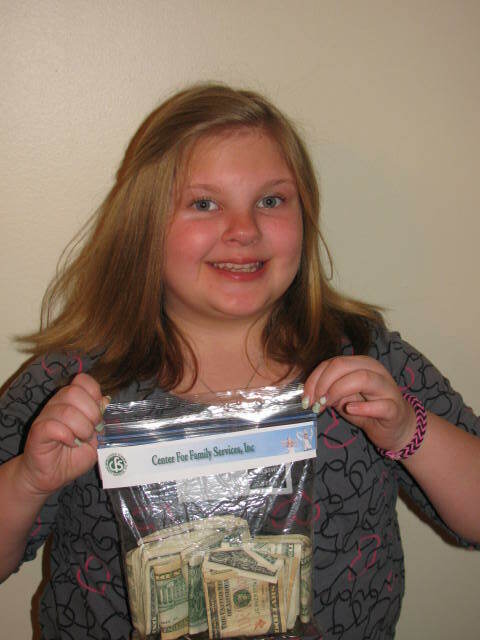 Miranda’s mom called to just ask how to drop off the money her daughter had raised and shared her story with us. Here is the picture you asked for, I hope it is ok. My daughter’s name is Miranda Wolf, age 12. She attends Neason Hill Elementary school and is in the 6th grade. She asked me one night if she could make and sell rubber band bracelets and give the money to a charitable organization. I told her that was a wonderful idea, so we sat down at the computer and looked up different organizations in Meadville. She decided she wanted to do it for the Center for Family Services. She went to her principal at her school and asked if she could sell them there. The principal agreed and they even announced it on the morning announcements that she would be doing this if anyone would be interested in purchasing one. She asked a few of her friends if they would be willing to help her make the bracelets so they would have enough and they agreed. They made over fifty on the first day and ran out so they got permission to sell them the next day too. They sold the bracelets for one dollar. Her and her friends made over fifty more for the next day and sold all of them too! I am very proud of her and her willingness to do something so giving and thoughtful. I know it’s not a lot but please know that is comes from and very giving and loving child! Thank you. Thank you Miranda! And please thank all your friends who helped you. Praise also goes to the school principal and Miranda’s mom for fostering her generosity. Does Miranda’s story inspire you to volunteer? Contact us, I’d love to talk to you.